'Fluid and inventive contemporary bassist'. 'His compositions are colourful, beguiling and thoroughly musical'. Mark Gilbert, Jazz Journal International. 'Ben is, as well as being an excellent bass guitarist, an experienced and intelligent bandleader and composer, who produces characterful but unpretentious writing, with good part writing and, frequently, extremely strong melodies - always a bonus'. 'Clearly an accomplished jazz composer'. The only member of this band whose name will be familiar to most British jazz lovers is trumpeter Steve Waterman. At the same time, you can be pretty sure that any project with which he gets involved will be worth paying attention to. Crosland himself plays nimble, mellow-sounding bass guitar which gives an attractive lightness to the texture and blends beautifully with the guitar of Stuart McCallum and drums of Dave Walsh. He also composed all but one of these eleven numbers, making imaginative use of the four instruments. Bass guitar and trumpet in unison, for example, make a surprisingly bright and fluid sound. Steve Waterman is a terrific player and this set finds him in excellent form. Let's hope that this new, young band gets the breaks it deserves. Bassist Ben Crosland has been working tirelessly on his compositions and small groups in the north of England since the early 1980's. 'Heartland' is the latest in a string of albums that reveal a keen writing talent and sound instrumental prowess. He brings a fusion touch to what is essentially an acoustic small group through light Latin rhythms and the lightly distorted tones of guitarist Stuart McCallum. Brassman Steve Waterman, long a Crosland collaborator, often recalls Kenny Wheeler and Dave Walsh fills the drum stool with lithe aplomb. It's easy to be dismissive about self-starting local talent, but like all of Crosland's albums, 'Heartland' is an engaging and often surprising album. Its melodies are strong, its thoughtful, controlled tone quietly compelling. Bassist/composer Crosland is on tour with this relaxed but tightly-played contemporary jazz-fusion music up to December, with a quartet including the resourceful trumpeter Steve Waterman. All the compositions here are by Crosland apart from one by Waterman, and the Pat Metheny-influenced guitarist Stuart McCallum is both a strong solo voice and a subtle counterpoise to the trumpeter in delivering the elegant themes. Waterman's fast bop playing is effortlessly skittish on Diminished Responsibility; there's a sonorous, dreamlike sway to the title track; and there's a quietly lyrical tribute to the late Don Grolnick. An often understated set, but with some excellent writing and playing. It's not easy to keep a band together these days, but Crosland has managed it. This is the quartet's second CD, and there is that indefinable feeling of ease about it that comes from musicians knowing each other's playing intimately. It reveals itself in firmness of texture and an unhurried use of space. Steve Waterman's trumpet and Stuart McCallum's guitar make a distinctive blend that owes a lot to Waterman's bright, buoyant phrasing. In fact, there is a bubbling good humour about the atmosphere of the whole set, epitomised by Crosland's 'A Knife through Butter', which fairly skips along, propelled by the leader's bass and the drums of Dave Walsh. There are more ambitious bands around the British jazz scene today, but few which convey a distinct character with such crisp informality. The fine quartet headed by Huddersfield bassist Ben Crosland is on tour this month on the back of this new album. Catch them if you can, because the music is very good indeed. It's thoughtful, intelligent jazz that makes its impact thanks to the quality of the original compositions by members of the band and the high degree of interplay between four musicians who know each other well. Steve Waterman on trumpet and flugelhorn takes most of the solo honours, with some lovely playing on the sweetly lyrical 'Song of the Beck' and his own 'Returning Home', though guitarist Stuart McCallum is not far behind. Crosland and drummer Dave Walsh are, as ever, models of selfless support. The term 'chamber jazz' has a slightly frosty ring to it, but the small-scale music of this excellent little band is as warm and inviting as any jazz lover could wish. The absence of drums gives it intimacy, and the relaxed pace lends a feeling of expansiveness and ease. The three players are Steve Waterman (trumpet and flugelhorn), Steve Lodder (piano and keyboards) and bassist Ben Crosland, who also writes most of their material. It would be hard to find a more well-matched trio. The interplay among them is unfailingly ingenious without descending into needless complexity. Threeway is the indefatigable bassist Ben Crosland's latest project, bringing him together once more with trumpeter Steve Waterman and Steve Lodder on keyboards. And an excellent trio they make too. As this CD shows, the players pull off the difficult trick of balancing relaxation and intensity - such a vital ingredient of successful small- group jazz. So Waterman unleashes one of his most powerful solos on Crosland's 'The Road Ahead', without disturbing the basically pensive mood, while Steve Lodder's solos are similarly fluent and full of ideas, yet slotting right into the groove. Most of the tracks are by Crosland, with one each from Waterman and Lodder - the effect is of a real conversation between three outstanding players. This fine trio is the brainchild of Huddersfield bassist Ben Crosland, who, in the company of familiar cohorts Steve Waterman and Steve Lodder, delivers some thoughtful and attractive jazz. Crosland wrote most of the tracks, and their performance is appropriately conversational, with the lead being swapped between Waterman on either trumpet or flugelhorn, and Lodder on keyboards. 'Minor Alterations', 'Spring in Somerville' and 'The Road Ahead' are particularly good. Worth checking out. Three of our finest musicians, Steve Waterman on trumpet and flugelhorn, Steve Lodder on piano and Ben Crosland on bass, perform an attractive programme written mostly by Ben. The title aptly describes the convivial situation with sometimes one holding the floor, passing on to another, then back. All three are on particularly good form. Ben Crosland (bass), Steve Waterman (trumpet/flugelhorn) and Steve Lodder (piano) make up Threeway, an exemplary jazz trio. Cracking instrumentals without percussion allow extra aural space for players' tonal invention and musical flair to come shining through. Superb. Bassist Ben Crosland contributed 10 of the 12 original compositions on the disc (the other two provide one each), but the trio's name is well-chosen. This is very much a three-way musical conversation, and a highly compatible one at that. The result is a delightful disc of impeccibly played chamber jazz that isn't going to pin your ears back, but is hugely enjoyable. They set up a relaxed vibe throughout the set, whether at ballad, mid- or up-tempo, but that should not be confused with any lack of vital energy or creativity in the music. Chamber groups with no drummer can sound a little austere at times in jazz settings, but there is never a hint of that here. The warmth and lustre of their individual and collective sound is complemented by lyrical and expressive improvising from all concerned, carried along on a highly responsive group interaction. John Etheridge is a versatile guitarist whose wizardry enables him to produce a whole anthology of unexpected sounds from a wide range of guitars. Here's a rattling piece that I find so exciting that I feel no need to apologise for calling its timbre 'the apotheosis of the curtain wire'. Every winter, guitarist John Etheridge loads his car with amplifiers, foot pedals and - space permitting - guitars, leaves the pampered decadence and duplicities of North London and heads up the M1 in the direction of Yorkshire. There he refreshes his soul with the rugged beauty of that great county, enjoys the straight-talking commonsense of its natives and plays music in the local jazz spots with two of its finest musicians, bassist Ben Crosland and drummer Dave Tyas. In contrast with his other, more closely-written projects, such as the Zappatistas or Soft Machine, John Etheridge's Trio North is a straightforward, uninhibited blowing unit and that is what we hear on this CD. Kicking off with Ornette Coleman's loping blues, 'Turnaround', Etheridge briefly tosses around a few motific ideas before turning up the heat with some blistering 32nd note passages. Perhaps it's something in the local water, but at times his edgy, intense virtuosity recalls the work of two other outstanding guitarists, both Yorkshire-born - John McLaughlin and Allan Holdsworth. In a quick change of mood, however, Etheridge follows this with a reflective reading of Carole King's 'Will You Still Love Me Tomorrow', stating the song as a ballad with just a sprinkling of reharmonisation, and never losing sight of the melody in his subsequent improvisations. While he also gives a fresh lick of paint to a couple of other pop oldies that are rarely heard in a jazz context - 'Fire and Rain' and 'Sealed with a Kiss', fully half of the 12 tracks on this CD feature Etheridge's own compositions. These range from the straight-ahead groove of the title track, 'Stitched Up', through the delicate 'St Mary's Loch', the Middle Eastern flavours of 'Simbel', with its overlapping textural sounds and drones, to the passionate country-rock 6/8 ballad 'Distant Voice'. This fine studio album successfully captures the energy and on-the-spot creativity of a John Etheridge live performance along with the breadth of his musical vision. This band comes into existence when guitarist John Etheridge plays his annual concert series in Yorkshire, where the other two members are based. As he says in the notes, the gigs 'fall nicely between the hit-and-miss of a pick-up band and the strictures of a fully rehearsed outfit'. From the listener's point of view that translates as the freshness of new ideas combined with the relaxation that comes with familiarity. Bassist Ben Crosland and drummer Dave Tyas keep pace with Etheridge's mercurial imagination and match his ideas so adroitly that altogether this makes a quite outstanding and engrossing set. Guitarist John Etheridge has so often been an interpreter of other people's music, that it's good to have a set that puts him firmly centre-stage - there are six originals here out of eleven tracks. The unaccompanied 'Simbel' and the melancholy 'St Mary's Loch' are among the highlights, and Etheridge's improvisational fluency and imagination are well captured on straightahead pieces such as 'Turnaround' and 'Softly as in a Morning Sunrise'. His range also extends to unfamiliar vehicles for jazz, like James Taylor's 'Fire and Rain'. Bassist Ben Crosland and drummer Dave Tyas are excellent in the accompanying roles, and the set adds up to a revealing portrait of John Etheridge, much as you would hear him in a club. This is the guitarist's Trio North, an annual get-together that allows some nice balance between the security of a regular band and the adventure and risk of a pick-up situation. Etheridge sounds in sparkling good form throughout, but he's exceptional on the unexpected 'Will You Still Love Me Tomorrow' and the lovely 'St Mary's Loch'. Crosland and Tyas are reminiscent of those redoubtables Cleyndert and Tracey, solidity personified. The Penguin Guide to Jazz Recordings, Ninth Edition. Bassist Crosland, a new name to me but Northern-based apparently, is the originator of all the music presented here, 12 pieces in all, and has sub-titled the recording as A Celebration of the English Calendar and Climate. So far, so programmatic, you might say. It's often tricky to assess the validity of such a concept, one man's reaction to a piece entitled, say, 'Sunshine and Showers' may well be markedly different to that intended by the composer. And so on. No matter, for this music works brilliantly on the prosaic level as a series of performances by three stellar musicians. Crosland's compositions are often quite captivating, the reactions and interplay between Crosland, Waterman and Lodder as near to perfection as anyone could want. Waterman rises to the challenge in exceptional fashion, fluent and centred, building improvisations of consequence, never wrong-footed, while Lodder's classical training allows him to amplify Crosland's intentions and to add compelling textural richness. The variation of mood is also well-managed, Lodder switching to a Fender Rhodes or Hammond B-3 effect as the piece demands, with Waterman equally at ease on a slow, elegiac piece such as 'Wine Under The Stars' or the sober 'Hymn for Christmas' as well as the more jaunty 'Cats and Dogs'. Given the paucity of instrumentation, one might hanker for more variety. Not so, for the compositional range is satisfying and rewarding'. Peter Vacher, Jazzwise, September 2009. Threeway comprises electric bassist/composer Ben Crosland, trumpeter Steve Waterman and keyboard player Steve Lodder; this is their second album, their first, Conversations, having been released in 2006. All the material on it is by Crosland and its twelve tracks follow the course of the year, from 'Crystal Morning' and 'Frosty Night, Cosy Fire' through to the likes of 'The Harvest' and 'Cats and Dogs' to 'Hymn for Christmas', but the album is not rigidly programmatic, though phrases such as 'chilly lyricism' and 'warm-toned flugelhorn' are not entirely in appropriate. Subtly, rather than fiercely interactive, the trio lives up to its name courtesy not only of the sharing of solo duties, but also of the gently persuasive interplay that characterises the band's approach. Lodder is mellifluous and subtly assertive as appropriate; Waterman sensibly rings the textual changes available from flugelhorn and open and muted trumpet (the latter particularly effective in conjunction with Lodder's organ), and with acoustic and electric piano also judiciously utilised, this is a surprisingly varied, and consistently accomplished, elegant and musicianly set from three polished performers. A chamber trio that generates intimacy and heat. The immediacy of Steve Waterman's trumpet blends with the rhapsodic keyboard of Steve Lodder and Ben Crosland's electric bass to delightful effect. Crosland's compositions celebrate the English climate and are suitably bracing and plaintive. Chris Ingham, Mojo, October 2009. Of course Miles Davis wrote the book on lyrical trumpet. What's great about Steve Waterman is the way he eschews Miles' dessicated corpsewalking in favour of vigorous, full-blooded sensitivity. Always melodic, always well-turned and elegant, he achieves a singing grace on the tunes here. And what tunes! All penned by bassist Ben Crosland and inspired by 'the English calendar and climate', they are as attractive as jazz has a right to be. The third member of the trio, Steve Lodder, is a tasteful accompanist, adding an undercurrent of joy to his exquisite piano trimmings. The absence of a drummer leaves more room for interplay, and Waterman, Crosland and Lodder are wonderfully simpatico partners. Perfection of its type. There is a pastoral quality to 'Songs Of The Year' that suggests an English idyll and Crosland reveals himself to be an excellent writer and 'musical illustrator' - there are some great tunes here. However, the album never lapses into folk whimsy, there are far too many strong musical ideas and genuine jazz playing for that. All three players have superb chops which stand up well in this exposed musical setting and the spirit of discipline and group interaction is strong throughout. 'Songs Of The Year' is a quiet delight and an album that sounds good whatever the season. Simple idea – a dozen impressionistic pieces portraying months of the year. Simple format – trumpet (Steve Waterman), piano (Steve Lodder) and Bass (Ben Crosland, who is also the composer). It would be easy to miss this among the avalanche of new British jazz material, but it’s a real delight, something that you can keep dipping into. The ensemble playing has the togetherness that only comes from top musicians who know each other well and think as one. Everything is clear and precise yet full of delicacy and feeling. Making a - to some surprising - appearance in fifth place behind Green, Dankworth, Skeat and Cleyndert in the recent British Jazz Awards, bass guitarist, composer and bandleader Ben Crosland has been a leading light in contemporary jazz in the north of England for some years. For this CD he unites an all-star cast of brass players (Steve Waterman, Martin Shaw, Mark Nightingale and Barnaby Dickinson) for a series of pieces based around works of art in the Yorkshire Sculpture Park. The result is a record of pure class. Given the heavyweight quality of the horn players one might expect Crosland to be rather outshone on his own album, but both his playing, and more importantly, his writing are captivating throughout. Indeed, his skills as arranger are such that he is able to conjure a whole range of moods from what could be, in lesser hands, a limited tonal palate. For example, there’s the straight brass chorale of In Memoriam, the funky Walkin’ the Cat and the gorgeous double flugelhorn writing on Black Steps. With deft use of Steve Lodder’s keyboard, Crosland is also able to hint at much bigger textures and the lack of a drummer is a decided plus in this instance. Needless to say, all the soloists are at the top of their game, but it remains Crosland’s compositional gift that most impresses. Try Pink Lady, Brown Dog, a theme worthy of Horace Silver, so insidiously catchy is its melody. This was a very rare opportunity to see this group live in Birmingham. Threeway have been in existence as a Trio for ten years. For this gig, vibraphone player Lewis Wright was added to the mix, thus allowing the group to reprise their latest album ‘Looking Forward, Looking Back’. Threeway consist of keyboard player Steve Lodder, bass guitarist Ben Crosland and Steve Waterman on trumpet and flugelhorn. The music for the evening was largely drawn from the band’s last album, with a couple of choice classics from the Great American Songbook included for good measure. The venue is a comparatively small upstairs pub room and it was pleasing to see an almost full house. For me, it was an added pleasure to see, up close and personal, three musicians whom I had long admired via their recordings. These are virtuoso musicians who are so comfortable with each other that their gentle music seems to fall naturally upon the ears. Deceptively effortless playing – the keynote here is melody. There is no showboating and the musicians’ natural modesty seemed to complement the music perfectly. At the same time the music demanded attention and the attentive audience sat enthralled throughout the evening. Steve Waterman’s circular breathing closed one particular tune in a quietly dramatic fashion. Compositions were provided by all three of the core band members and it is testament to their wonderful melodies that their interpretation of a song always associated with Doris Day, ‘Secret Love,’ could almost have been one of their own compositions. All credit to the guys at Birmingham Jazz for bringing Threeway to town. This is a band that gives the term "chamber jazz" a good name. All three are virtuoso players who know each other so well that their improvisations just seem to fall into place. It's subtle music – warm, melodic and gently intriguing. Ben Crosland, bassist and leader, composes most of the tunes, with occasional contributions from pianist Steve Lodder and trumpeter Steve Waterman. This time, they are joined for about half the programme by vibraphonist Jim Hart, who proves to be the perfect guest. In the absence of drums, his instrument adds a gently percussive sparkle to the proceedings. Threeway are among the best exponents of the “chamber jazz” idiom…The three core members are excellent players and composers and the tunes gathered here offer both strong melodic content and plenty of scope for improvisation by three masters of the genre. The judicious use of electric instruments adds to the breadth of the group’s sound and the addition of Hart’s vibes brings even more colour and rhythmic impetus, he’s an inspired choice as a guest …this typically well crafted album offers the opportunity for listeners to enjoy Threeway’s delicate strengths as the group celebrate ten years of subtly creative music making. Threeway - bassist and composer Ben Crosland, pianist Steve Lodder and trumpeter/flugelhornist Steve Waterman - already has two critically-acclaimed CDs to their credit, and this immensely enjoyable new recording will certainly add to the group's reputation. Looking Forward, Looking Back is dedicated to the memory of bass master Jeff Clyne, with whom Crosland studied early in his career. The track Blues for Jeff is one of Crosland's appealing and strongly melodic compositions…Much as I admire drummers, it's always refreshing to hear a group succeed in swinging hard without the driving pulse of cymbals and percussive punctuation. Threeway succeed admirably, and this album can certainly be recommended. The music is subtle and warm, and Hart compensates for the absence of drums in that he adds rhythmic impetus in a gentle way; the improvisations float along, always with a sense of purpose and with great regard for each other’s ideas. Most of the compositions are by Crosland and have plenty of improvisional possibilities... This is gentle, absorbing music which constantly maintains interest – who could ask for anything more? BASS player Ben Crosland formed his Yorkshire-based quintet just ten years ago and Jazz Services are helping the group to celebrate by organising a six-gig tour which stopped off at the Bonington Theatre on Thursday. For the Bonington gig the quintet was augmented by Steve Waterman (trumpet), Alan Skidmore (tenor sax) and Mark Nightingale (trombone). Led from the rear by Ben's bass guitar, the quintet piano-less rhythm section incorporated the impeccable, disciplined drumming of Dave Tyas and guitarist Steve Buckley, an elegant and graceful soloist. Rod Mason chose from an impressive collection of reeds including four saxes, flute and bass clarinet. His contributions revealed a consummate dedicated musician. Mike Hall, another saxophonist, played tenor and soprano, with a more biting and metallic approach. Steve Waterman was introduced on a Crosland original, Ingleborough Heights, highlighting his crackling tone playing flugel horn. Northern Run, another of Ben's compositions brought on Alan Skidmore, who added even more muscle to the front line. Mark Nightingale, another world class player, was introduced on a ballad, Blue. His expressive lyrical trombone, incredible imagination and dexterity never flagged in a flawless performance. The wide diversity of instruments and superb arrangements produced unusual voicing, exciting sounds and brilliant solos. The Moonraker was a typical example - a powerful number with Mingus-like lines launched by Mason's baritone sax and Mark Nightingale's trombone. JAZZ is supposed to be "the sound of surprise", but sometimes it can be the music of bland predictability. Fortunately, the Ben Crosland Quartet, led by the Huddersfield bassist and composer, is not strong on predictability. To be sure, the group works within fairly tight arrangements, but plenty of latitude is left for the musicians to strike out on strange tangents and for numbers to take on a new and surprising character. This was best illustrated at Saturday's Huddersfield Jazz performance by the band's approach to the standards The Way You Look Tonight and Once I Had a Secret Love, two rather saccharine show tunes which were thoroughly deconstructed by the Crosland quartet, particularly by the principal soloists, trumpeter Steve Waterman and guitarist Stuart McCallum. Secret Love in particular was turned inside out, first by Waterman's unrestrained virtuosity and then by McCallum's highly original approach to jazz improvisation. He has the fast, free flowing technique and harmonic awareness of the jazz player combined with the edge of a rock musician and a willingness to use electronic effects sparingly.The result is a highly exploratory solo style, which remains intriguing from the beginning of a gig to its end. Most of the quartet's repertoire consists of original compositions by Crosland or Waterman.Ben Crosland himself, a rock solid bass guitarist, is a highly experienced jazz composer and arranger who actually has the ability to come up with a memorable melody. For example, Heartland is a very poignant tune - beautifully put over by Waterman on flugel horn - which would provide some TV drama producer with a good theme. Any tendency towards sentimentality was quickly subverted when both Waterman and McCallum introduced some dirty blues phrasing into their solos.The dynamic young drummer Dave Walsh completes the quartet and the back line of the group works very closely together - as evidenced by the amount of gleefully conspiratorial grinning that was going on all night.It was almost as infectious as the music. Bass player Ben Crosland is in many ways the perfect band leader. He brings together great musicians and then sits in the background, an avuncular presence holding down a smooth, solid bass line while keeping an eye on the proceedings. He has no pretences to play like an angel but he gathers angels around him and has held his own quartet together for some years now, no mean feat in the fluid world of jazz. The particular musical angels - both key members of Crosland's quartet since its inception - are Steve Waterman on trumpet and flugelhorn and Stuart McCallum on guitar. Waterman is well known on the jazz circuit as a lyrical player with extraordinary technical prowess who also composes, teaches and is the author of a benchmark trumpet tutor. McCallum, on the other hand, was a new force to me. Sitting nonchalantly on his amp throughout the evening, looking as if he was strumming a few chords in his back room, he showed himself to be right in the groove and master of a truly individual approach. Although it was clear from the first number that there was a fine quartet on the stage, the music didn't really come together immediately and the first couple of Crosland compositions seemed rather bland. Then Waterman played his own ballad October Arrival, a beautiful tune full of melodic surprises and harmonic depth. This was followed by Crosland's A Knife Through Butter, an upbeat number that gave McCallum the opportunity to stretch out, using a masterly combination of fast runs and chord figures that were an excellent contrast to Waterman's pyrotechnics on trumpet. Drummer Matt Home also showed us how to build a percussion solo from quite minimal use of a small kit. In the second set, with a well chosen selection of mostly original pieces, the band really got into their stride. In Crosland's Seachange, McCallum showed how he could play with great rhythmic intensity still without turning up the volume or moving from his relaxed position. Waterman is the only trumpeter I know who has mastered circular breathing, which allows one to play on without pausing for breath, and yet he manages to maintain a perfectly accented line. The evening ended with Waterman's Destination Unknown, in which the trumpeter gave us one more demonstration of his extraordinary skills ending on a seamless flow of notes. One of John Etheridge's great heroes, Frank Zappa, once (characteristically) used a common criticism of himself as an album title: Shut Up'n Play Yer Guitar. This is basically the approach followed by Trio North, in which Etheridge stretches out in the company of bassist Ben Crosland and drummer Dave Tyas. His material, whether he's playing with organist and saxophonist or just with a rhythm section, is usually drawn from a broad spectrum of contemporary music, and so it was no surprise to find him starting his performance with R&B, moving swiftly on to a bop classic (Dizzy Gillespie's 'Wee'), then subjecting the odd samba (Jobim's 'How Insensitive') and jazz standard ('You Don't Know What Love is', 'Love for Sale') to Etheridge-trio treatment. In the latter case, this saw the Porter tune tastefully (though its writer would probably not have agreed, given his celebrated fussiness about changes to his songs) 'funked-up' so that tension and tightness were injected into it, and Etheridge's sharp, spiralling runs made all the more effective for being compressed into the funk format. With Crosland and Tyas, as Etheridge points out in the liner-notes to the trio's recently released album, Stitched Up, 'a strong, flexible and resourceful rhythm unit …', this was (again to quote Etheridge) a gig that fell 'nicely between the hit and miss of a pick-up band and the strictures of a fully rehearsed outfit'. ...There was nothing remotely lukewarm, either, when John Etheridge's Trio North played Newcastle's Corner House Hotel, the guitarist's dazzling fluency impressively aided by West Yorkshire's Ben Crosland on bass and Dave Tyas on drums. Etheridge also included a fine extended solo set ranging from rippling Township jazz to hard bop virtuosity. Well worth calling into Zeffirellis in Ambleside for Ben Crosland's band, featuring stalwarts Rod Mason on saxophone, Dave Tyas on drums and Ben himself on bass. New to me was Manchester based pianist Paul Kilvington, who was outstanding. The band's repertoire was mainly drawn from the Steps and Steps Ahead catalogue. 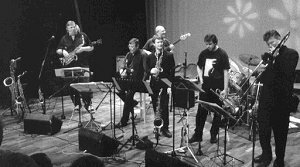 Happily, the days are long gone when the UK scene was highly London-centric and the gig emphasised yet again the overall strength in depth of jazz musicians across the UK. As the name implies, this wasn't a frontline horn with backing set up but a trio of equals playing lines that complemented and supported each other. Of the many highlights, Secret Love with its bravura trumpet intro stood out before it was kicked upfield for the piano to carry with some fancy fingerwork before trumpet picked up the ball and ran with a triple-tongued blast that may have begun in Arban's Method For Trumpet but didn't end there! Breath-taking, or, to be more precise, circular breath-taking. Threeway was established in 2004 by Ben Crosland, a bandleader, composer, and highly accomplished electric bass player. His aim was to explore playing his own original compositions without percussion. 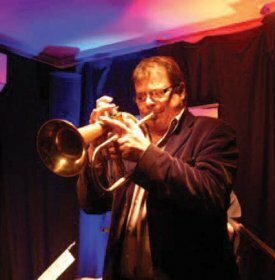 Besides Ben, the combo comprises Steve Waterman, a highly regarded trumpeter who also plays flugelhorn, and well-known pianist, Steve Lodder who also features on keyboards. The gig featured mainly Ben's compositions from the group's two CDs, Conversations (2006) and Songs of the Year (2009), the latter featuring numbers portraying different seasons or aspects of the year. Threeway is a tightly-knit, highly integrated outfit in which the artistes display an intimate understanding of each other's approach. They combine technical perfection with great accessibility - to the extent that their music appeals to jazz novices and connoisseurs alike. Their style is instantly recognisable and their melodies remain long in the mind. The composition titles, for instance, Crystal Morning, Wine under the Stars, Sunshine and Showers, and Autumn Dance, are evocative of the group's relaxed approach, enabling it to experiment and explore without inhibition. Take Across the Land, a composition by Steve Lodder. While playing piano with his left hand, he manipulated the keyboards with the other hand to produce a hauntingly surreal sheen to underpin the melody. As a complement, Steve Waterman played on top with successive melodic contrasts, moving from a gentle tone to rasping, breathless climax. This exploratory approach typically weaved in and out of each number. The group is equally at home with standards. Days of Wine and Roses involved similar exploratory features in a startlingly effective way. Usually a ballad, this tempo was upbeat. Steve Waterman's opening statement on trumpet was little short of a masterpiece, a richly lyrical and highly imaginative piece of improvisation, insistently supported by Ben Crosland's bass. Steve Lodder provided a sparkling, foot-tapping solo - he works the piano hard and it seems to drive the others to greater heights. Another standard, Secret Love, was also taken at a highish tempo, with Lodder again leading the way after a sensitive, gentle opening from Waterman which simply beckoned the fast, swinging rendition which followed. And then to the final number - Destination Unknown, a composition by Steve Waterman - and a tour de force indeed. It found the group expressing more than a hint of jazz rock. The climactic solo, a five-minute unaccompanied repetition of the theme by Steve Waterman, brought the gig to a rousing and memorable close. The group clearly enjoyed the whole experience. Typical was Ben's comment on the venue, 'I wish we could pack it up and take it with us everywhere,' he exclaimed. At a time when some jazz takes itself too seriously, it was good to see artistes offering impeccably presented, eclectic jazz - and so obviously relishing every minute. THIS was one of those happy occasions where the musicians got such a kick out of playing together that the audience was swept along with them. Ordinarily, the Ben Crosland Quartet would have been enough for a splendid evening of jazz, but we also had the added bonus of tenor sax player Alan Skidmore’s presence. Described as a heavyweight of UK and European jazz, Alan has a distinguished history and his abilities seem undiminished by the passage of time. He begins his solos with warmth and swing, playing with magisterial authority. Gradually increasing the intensity of emotion, he then includes honks, whoops, squeals and the repetition of note clusters at finger-breaking speed. These effects seem to be obligatory for many sax players; those who eschew them are rare exceptions. It must take a superbly accomplished and confident saxophonist to agree to share a stage with someone with a reputation as large as Alan’s. We had just such a one in Rod Mason, nicknamed the Room Darkener by Alan. Rod towers above everyone like Hagrid among Hogwarts pupils. As a saxophonist Rod is as good as you’ll get. He was outstanding throughout, teeming with ideas whether on soprano, alto or tenor. Next in altitude was Ben Crosland, who perched on a tall stool. With his shaved head and amiable face, he presided over events like a benign Buddha. His work on fretless bass provided a rhythmic anchor whilst his solos demonstrated great skill. The brilliant pianist Paul Kilvington was the musician closest to the ground as, although rising from the stool in his enthusiasm, he crouched very low over the keyboard. In this uncomfortable looking stance he played wonderfully original music. Sometimes he was delicate or could drive powerfully. Often he created counter-rhythms within his solos but above all he conjured a seemingly endless stream of unpredictable invention. Dave Tyas, mopping his face with a towel that was the exact shade of red to match his drum kit, proved himself the complete artist; driving in ensemble work, sparkling in four-bar exchanges and able to make creative thunder when called for. This band gave us a fresh repertoire played with ebullient zest. Appropriately for a seaside venue, the audience engulfed them in a tidal wave of applause. Bassist and composer Ben Crosland is a key figure on the jazz scene in the North of England. Based in Huddersfield he is an experienced band leader and a prolific side man and also runs his own record label Jazz Cat, an outlet for his own recordings plus those by saxophonist Rod Mason. Crosland has been a previous visitor to the RAJB as part of Mason’s Elements group and guitarist John Etheridge’s Trio North. Threeway is Crosland’s drummer less group and features two of his regular musical partners Steve Waterman on trumpet and flugel horn and Steve Lodder on piano and keyboards. The well received “Conversations” (Jazz Cat, 2005) was a good introduction to the trio’s sound, intimate, but thanks to Crosland’s electric bass surprisingly rhythmic. This was music with the refinement of chamber jazz but with enough sparkle and energy to avoid becoming becalmed. In 2008 the trio refined their approach with “Songs of the Year”, a series of twelve themed pieces illustrating the English seasons, a project that grew out of a commission for Crosland’s quintet (the musicians from Threeway plus Rod Mason and guitarist Stuart McCallum) at the 2003 Marsden Jazz Festival. My review of “Songs of The Year” can be found elsewhere on this site. For today’s performance Threeway drew upon both of their recordings and also included a couple of pieces by Steve Waterman. They began with “Crystal Morning” from “Songs”, an aural depiction of a crisp winter’s day with Waterman’s bright trumpet depicting the clarity and sharpness of the weather conditions. Lodder’s equally sparkling piano solo was well balanced by Crosland’s excellent bass playing, providing a rhythmic pulse but also setting up teasing counter melodies. Crosland is an electric bass specialist, capable of producing a sound of genuine warmth and subtlety from his fretless instrument. He’s an innately tasteful player, clearly influenced by Jaco Pastorius but without the latter’s penchant for grandstanding. “Wine under The Stars” from the same album depicted balmy summer’s evenings- and in fairness the weather in Lichfield was pretty good today, perhaps “Beer under the Canvas” would have been a more appropriate title. It began with Crosland’s appropriately languid solo bass intro followed by the warm tones of Waterman on flugel horn and the gentle lyricism of Lodder at the piano. The RAJB committee always hire (presumably) a proper grand piano which is a big plus as far as I’m concerned. Mind you there have been occasions when exuberant performers such as Tom Cawley and John Law, both of whom I admire greatly, have given it a bit of a bashing. Still keeping with “Songs of the Year” the piece “Sunshine and Showers” was a showcase for the trumpet skills of Waterman, his open horn soloing ranging from mellow to fiery yet always possessed of a dazzling clarity. His own “October Arrival” then allowed him to demonstrate equal skills on the flugel horn with an unaccompanied introduction and subsequent solo alongside features for Lodder on piano and Crosland on bass. The trio closed their first set by turning to their first album for “Across the Land” with Lodder establishing a loop of synth string sounds to cushion enterprising solos from Waterman on trumpet and the composer on both piano and electric keyboards, frequently playing both simultaneously. This was a hugely enjoyable first set that had illustrated the intelligent writing of both Crosland and Waterman and the excellent instrumental skills of all three musicians. Despite the occasional sound glitches I was hugely impressed. Later in the day the trio’s equally enjoyable second set drew more heavily on the “Conversations” repertoire beginning with “Spring in Somerville ”, a title that wouldn’t have seemed out of place on “Songs of the Year”! With features for Waterman on trumpet and Lodder on piano this was a good re-introduction to the trio’s lyrical but surprisingly full sound. A particular set highlight was the inclusion of Crosland’s tribute to the late Jeff Clyne, “Blues for Jeff”. One of the doyens of British bass playing Clyne was a superb exponent of both the acoustic and electric versions of the instrument and was a superb teacher and educator and all round nice guy. He was a great inspiration to Crosland and was influential with regard to his decision to concentrate on electric bass. After the gig Ben and I talked about Jeff and shared fond reminiscences of Jeff’s late 70’s/early 80’s band Turning Point. Meanwhile this affectionate tribute included solos from Lodder on electric piano and Waterman on trumpet followed by an extensive electric bass feature from Crosland before Waterman restated the appropriately bluesy theme. The next piece began with a stunning solo trumpet introduction from Waterman encompassing highly embellished cadences as his solo developed in complexity. This was succeeded by (relatively) more straight forward statements from Lodder on piano, Waterman on trumpet and Crosland on bass on this essentially good natured piece. The trio’s performance concluded with Waterman’s tune “Destination Unknown”, originally recorded for the (very good) 2004 Crosland quartet album “Last Flight Out”. With Crosland at his most rhythmic this was arguably the most forceful number of the two sets with Lodder’s synth interjections punctuating Waterman’s trumpet solo. The keyboard player doubled prog rock style on his solo playing both piano and keyboard and the piece finished with a stunning solo trumpet cadenza from the composer. Overall I was highly impressed with Threeway, this was chamber jazz performed with good humour and a bit of Northern grit. There was nothing “precious” about this music despite the many moments of beauty and of course the playing was terrific from three highly experienced and professional musicians. Thanks to Ben for taking the time to speak afterwards, he may be a proud northerner but he’s a great asset to the UK jazz scene as a whole. As ever Etheridge's rhythm section were rock solid, drummer Dave Tyas relentless in providing energetic drive overlaid with sensitive colour and accent (especially on 'In Your Own Sweet Way' and 'Sister Sadie'), and bass guitarist Ben Crosland was meticulously self disciplined in the exploitation of the 'fretlessness' of his instrument, and demonstrated deep melodic alertness in his exchanges of perfectly judged lead phrases with Etheridge (esp. on 'In Your Own Sweet Way'), and structured solos which brought additional meaning to the numbers in which they were embedded (as in his excellent work on 'See My Baby Once Again') and his soft reflective contributions to the otherwise rocky interpretation of 'Sister Sadie'. But of course Etheridge was firmly centre stage, and every time I hear him play in the intimate cellar-bar at The Cask, I feel privileged - not just because he is so good but also because even when he plays a small venue he works so hard and with so much honesty. On this occasion he was very relaxed, perhaps playing further behind the beat than he normally does, seemingly in no hurry - though in his own time he did reach his usual sheer speed and dazzling dexterity; clipped razor sharp phrasing through 'You Really Got Me' in his own 'The Venerable Bede' a solo which climaxed in a sparkling rapid-fire deluge of precisely directed notes, and some vicariously mean and bitchy work on 'Sister Sadie'. It seemed to me as if Etheridge's laid back mind set gave him more space to indulge the 3D synaesthetic dimensions of the electric guitarists art, the dimension so well exploited, for example, by both Hendrix and Zappa . . . that is to say, his style seemed to me to be more visual than usual. Other highlights? In my notes I described his solo in 'In a Sentimental Mood' as hovering in some dark place without ever falling, blue mooded, driftily melodic, notes scattered like rainbow drops of dew...and as always his interpretation of 'Little Wing' was totally captivating, and the encores, 'a shuffly thing in A' and 'Johnny B Good' tied off a great evening on a perfect high.